I’ve spent the last four days acquainting myself with Pohang, a city in North Gyeongsang Province that Therese calls home. She’s been living here for the past year teaching English in two near by fishing towns and I was excited to see a snapshot of what her life has been like. 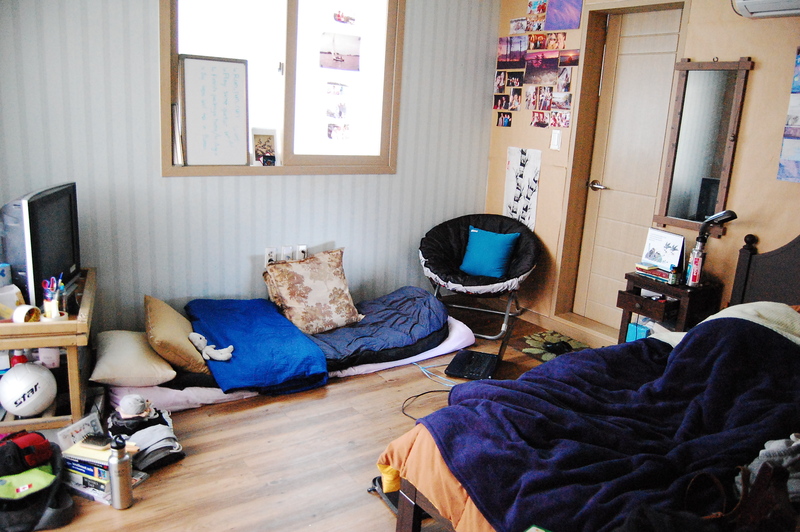 The main room of the apartment, excuse the lumpy bed, Therese is still asleep. Therese’s apartment is on a little side street in downtown Pohang. It’s a modern, clean building walking distance to the grocery store and local restaurants. The apartment itself is modest but cozy with bamboo floors that are heated. There is a small kitchen with stove top, a laundry room, washroom and main area where she has her bed, a television, a comfy chair and now my mat on the floor that we use as a couch by day and bed by night. Pohang’s main industry is steel, manufacturing the metal for companies like Hyundai (who along with Samsung own everything it seems over here.) The city is also fueled by its proximity to the ocean (it is a coastal area) and the fisheries are a major source of revenue as well. 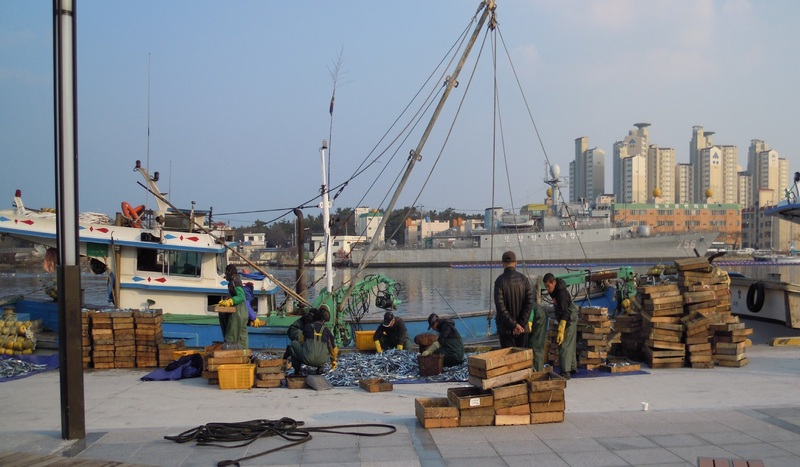 Unloading the catch of the day in Pohang. Although it has been chilly Therese and I have taken some strolls on the board walk that runs along the Hyeongsan River out to the ocean and a beautiful white-sand beach. Walking this path you pass countless fishing boats of all sizes and if you catch them at the right time on the right day you may see some of their haul from the salty waters. 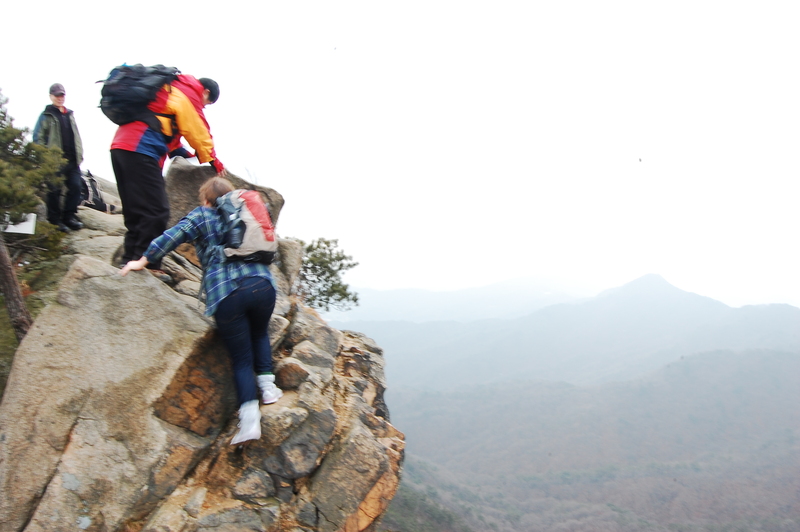 On one of the trials in Pohang's foothills. in the distance and if you make an effort to get to them you’ll find some solitude on their trails. 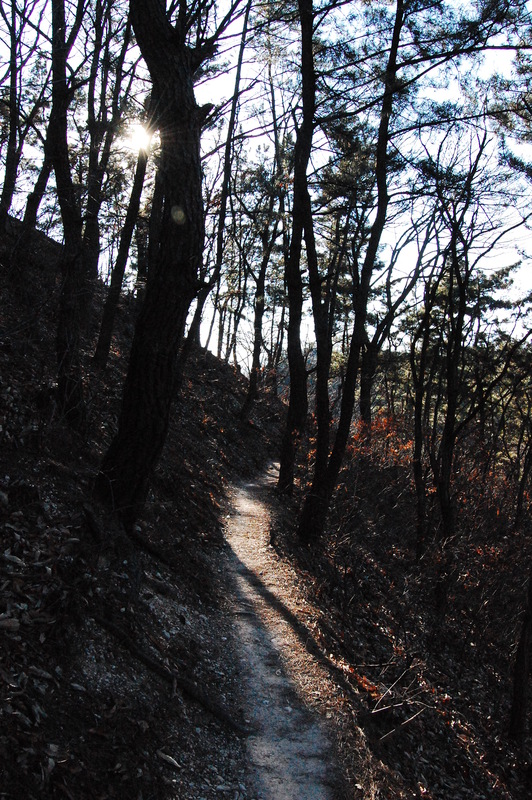 Since being in Pohang I have spent a few afternoons wandering and exploring, ending up in the hills on some of the paths. It is peaceful and if you climb to the top provides a beautiful view of the city. Yesterday I had the pleasure of accompanying Therese to school. It is winter holidays for her students so no children are around but she still needs to be in her classroom planning lessons (or killing time) until they return. Visiting on such a day was a perfect introduction to her school and work environment for the past year although I plan to come back and meet some of the students before we leave for South East Asia. Therese has her own wing in one of the buildings with bright new classroom equipped with a massive touch screen television and whiteboards. While I was visiting she had received a shipment of English books for her students so we had fun flipping through our childhood favourites like Dr. Seus and Roald Dahl as we unpacked the new books. You're now entering the English Area! Today we are leaving for the Golgulsa temple in Gyeongiu where we will spend Saturday and Sunday following the teachings and meditations of Buddhist monks. I’m very excited and will post about the experience when we return. As the plane touched down in Seoul my left foot was asleep and I was feeling like I needed a good shower. Twenty-four hours of travel is exciting but it can also be a bit tedious so needless to say I was glad to finally arrive. After some wandering I came face to face with Therese and so begins our adventure together. 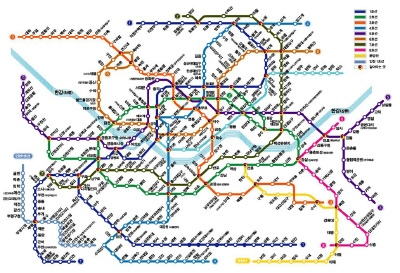 A map of Seoul's subway system. Therese had only been in Seoul a handful of times so the two of us put our heads together to figure out the complex subway system in the city. We would be staying in the Hongdae district of the city and would need to take three different trains. Without too much trouble we managed to figure out where we needed to go and made it to the BeBop House – the hostel we would be calling home for the next five nights. The hostel was cozy, run by a quirky and kind pair of twenty-something Koreans, MK and Olive. 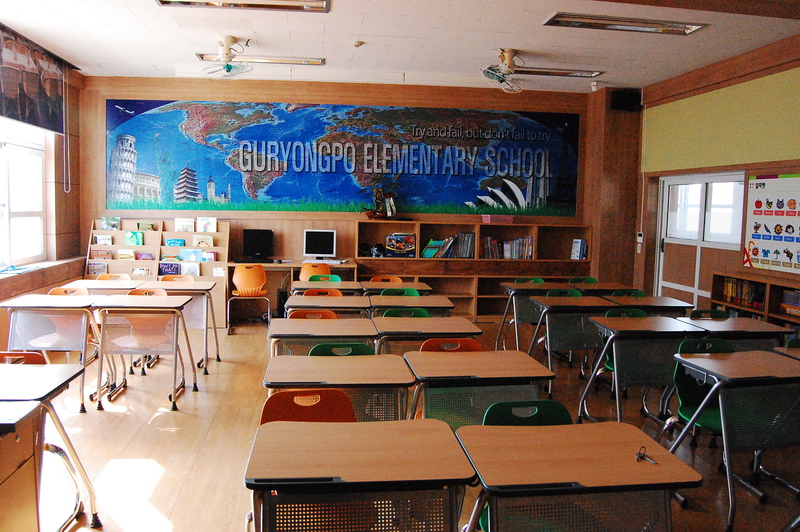 It had two floors with three dorm style rooms and three private rooms, as well as two bathrooms, two common areas and a kitchen, each plastered with world maps, magazine clippings and artwork done by the hosts and the guests. While in Seoul, Therese and I kept ourselves busy taking in the rich history and beautiful natural landscapes the city has to offer. Restored details on the palace entrance in Seoul. A highlight was visiting Gyeongbokgung, the largest of five royal palaces in Seoul built over 600 years ago. It was the home to the Joseon dynasty and features what I think of as typical Asian architechture, a pagoda style with ornate painting and beautiful detail. During our visit we also experienced the traditional changing of the guard. Although the ceremony is strictly tourist in its purpose today, we still enjoyed the bright colours and almost Arabic sounding music that accompanied the procession of royal guards and flags to the palace’s front gate. 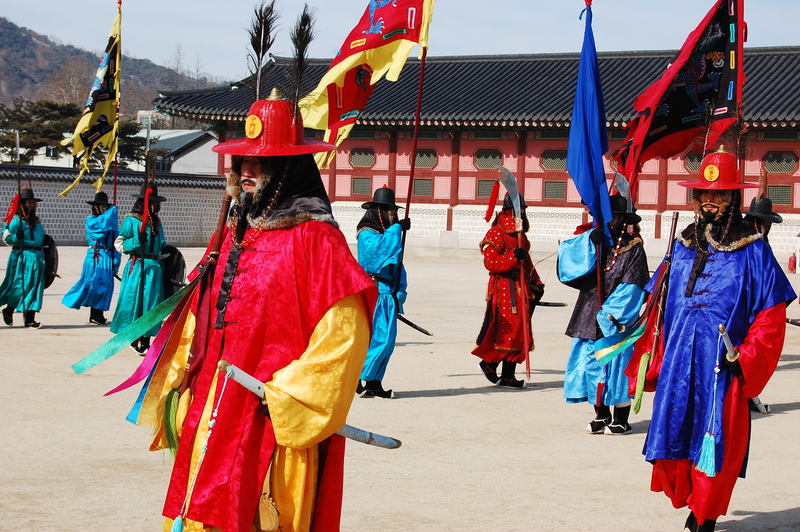 Changing of the guard at Gyeongbokgung Palace in Seoul, South Korea. Next to the palace is the National Palace Museum, which we then spent some time wandering through. The museum gave some context to what we were seeing and had countless artifacts on display. I was most interested in the display of science artifacts from the Joseon dynasty. The exhibit included sundials and massive stone tablets used to chart the cosmos, as well as early globes and counting tools. That same day we also made the trip to Namsan Mountain, a small mountain in the heart of Seoul which is best known for being the home to N. Seoul Tower. The tower is primarily a tourist attraction and looks like a smaller version of the CN Tower. To visit the landmark you must first hike up the mountain, a hike our trusty Lonely Planet guide suggested was best done in the evening. 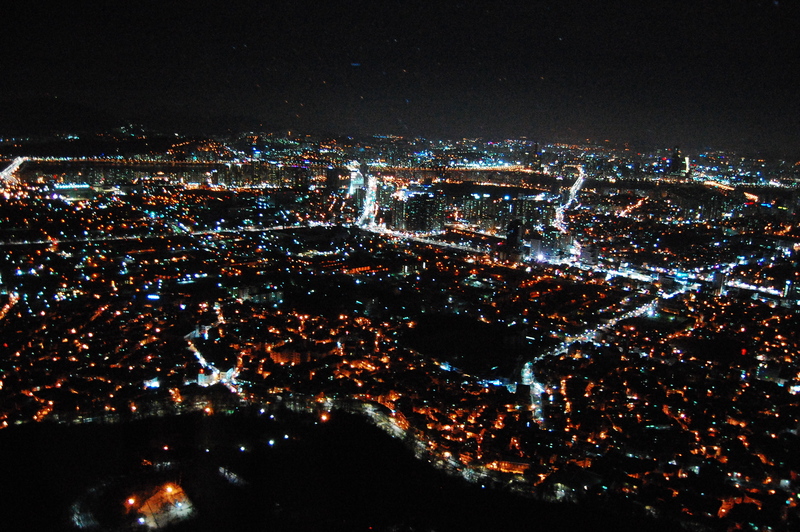 The view from the top of N. Seoul Tower. Therese and I followed the guide’s advice and we trekked up the hill as the sun set, arriving at the top to a beautiful view of the city lights. So far my favourite parts of the trip is the time we spend outdoors, walking and wandering the streets and park of South Korea. The best example of this was January 21, when Therese and I spent the day hiking up Bukaksan mountain in Bukaksan National Park. We got an early start, leaving the hostel in good time and riding two subway lines and a bus to the entrance of the park. 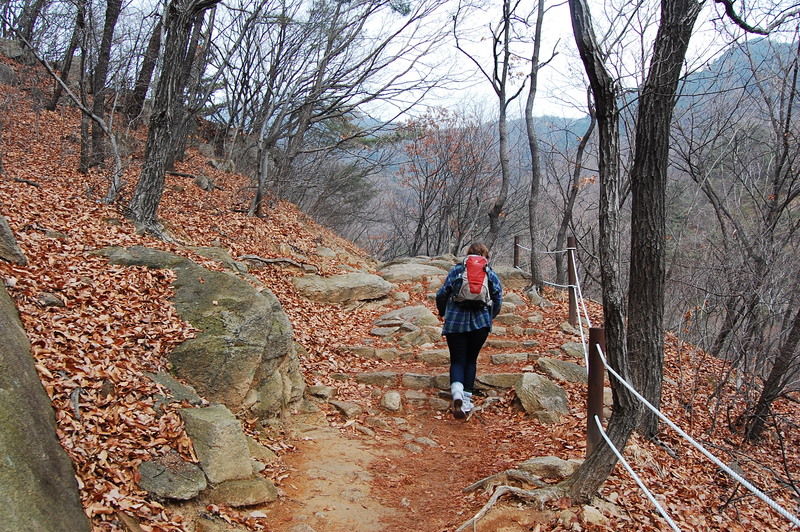 We started our ascent on a beautiful, although very landscaped, trail winding its way up to a wall built in the 14th century to protect Seoul during conflict. The wall is sometimes refered to as the great wall of Korea and joins the four mountain peaks of the city: Naksan, Namsan, Inwangsan and Bukaksan. One thing you should know about Koreans is that appearances and material goods are very important. Women are constantly applying make up on the subway and no matter the time of day stores are packed with people purchasing clothing, cosmetics and accessories. As we got off the bus to walk up to the national park we passed numerous hiking stores and Korean men and women decked to the nines in hiking gear: boots, backacks, poles – you name it, they’ve got it. Therese climbing the path up Mt. Bukaksan. Now I must admit I was scoffing at them as we passed in running shoes and jeans, walking up the manecured paths to one of the wall’s gates. I must also admit I was eating my words as my temperature rose, the pitch increased and my breathing grew heavy. I thought I was in shape! Maybe those hiking poles weren’t such a bad idea? 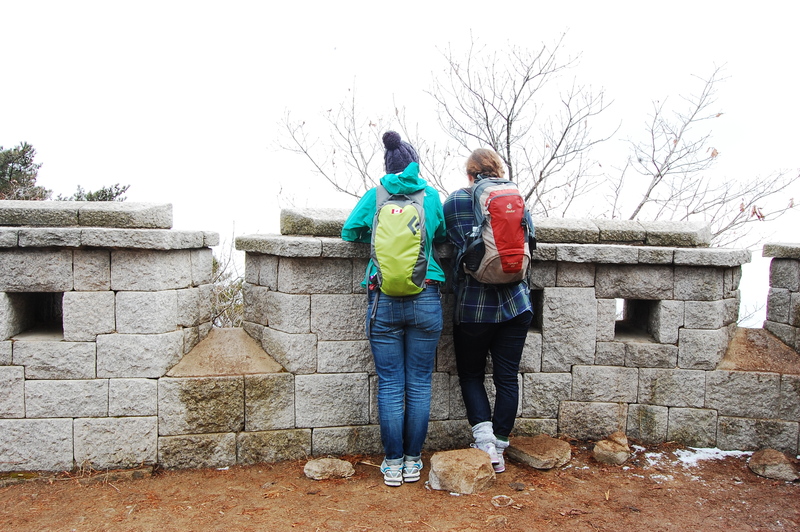 Looking out over the wall that surrounds Seoul. When we got to the wall Therese and I took a moment to take it all in before becoming quickly distracted by a person off in the distance on the mountain’s peak. It looked rocky, scary and right up our ally. “I want to go up that,” I said to Therese. She just nodded and started heading off in that direction. Now this is when our adventure got a little more complicated. The paths were gone and the pitch had increased and I think we (and some of the hikers around us) realized pretty quickly we were a little out of our league. Therese and our unofficial guide climbing up the moutain ridge. Luckily a kind fifty-something Korean man who couldn’t speak a word of English took us under his wing and lead up us the mountain’s ridge to its peak. The view was spectacular and, to be honest, the photos just don’t do it justice. We could see all four mountains from our perch as well as a good chunk of the historic wall. While at the top we celebrated with a rice cake one of the other hikers offered to us, the perfect soy-cinnamon concoction to consume before descending the opposite side of Bukaksan. That mountain adventure has given Therese and I hiking fever and we’re already planing our next big adventure when we’re in Southeast Asia. We’re working on trying to get permits to climb Mt. Kinabalu in Malaysia. At the top of Bukaksan and quite pleased with myself. 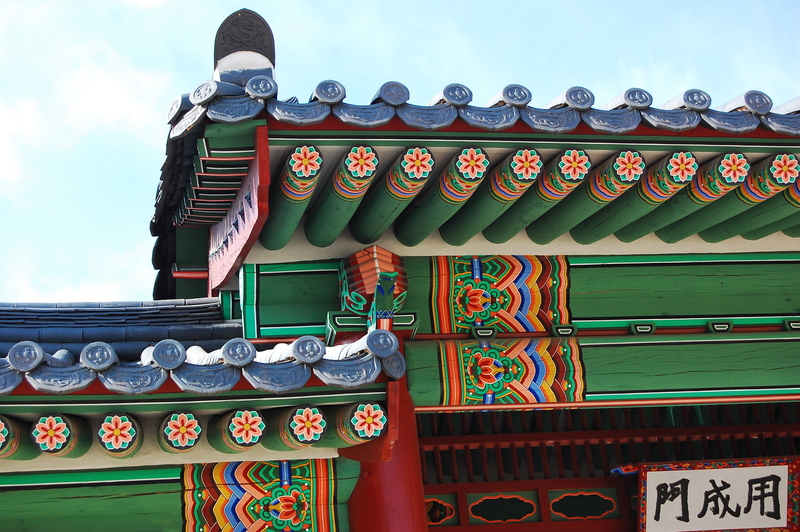 While in Seoul it was Lunar New Year, a holiday that marks the start of the Korean calendar, much like Chinese New Year. (In fact, it is the same holiday and is celebrated on the first new moon of the year.) This holidays sees Koreans leave the city and flock to their hometowns and much of the city shuts down. We were nervous at first that not much would be open on the holiday but managed to find some fun activities to occupy our time including a visit to Namsangol Hanok Village. This is a folk village in Seoul that had activities and events for the holiday including traditional mask, flute and kite making, games, song and dance. Therese and I took advantage of everything carving our own bamboo flutes and making prints of the new year’s tailsman, a Korean symbol for very good luck. Now we have taken a bus ride four hours South of Seoul to Pohang, Therese’s hometown. We’ve settled into a comfortable routine in her cozy apartment as I plan for my next adventure in China and she finishes up the final 16 days of her contract to teach English. 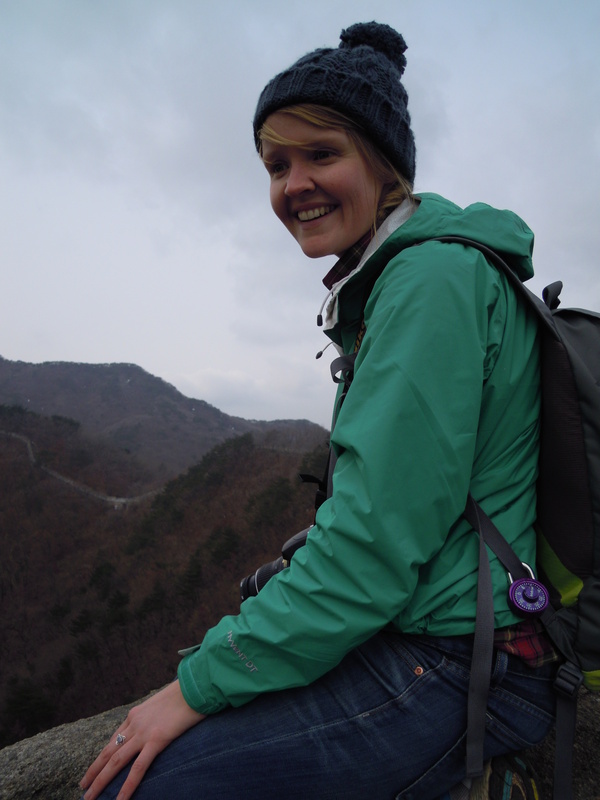 Stay tuned to hear about life in Pohang- until then I hope you’re all well and keeping warm. I imagine the weather we’re having here (-5 and sunny) is pretty similar to what you’re experiencing at home. The time has come to bid a fond farewell to my truest of loves and make my way across the ocean to Asia. As I type I am sitting in my Grandmother’s living room. It’s 12:35 a.m. and I’ll be waking up my Mom and Dad in just 3 hours to drive me to the airport. A couple of butterflies have made themselves quite comfortable in my stomach. The last few days have been a blur of joy and sadness. Although I am terribly excited (and cannot wait to see my dear friend Therese) I am also quite nervous and am leaving behind a wonderful group of friends and family. Luckily, I have had the opportunity to visit with most of them this week, jotting down addresses for postcards and sharing prolonged hugs. Two of the loveliest ladies, Tania and Beth, threw me a going away tea party. It was 1950s themed and we ate pastries, listened to Elvis and painted tea cups. It was the perfect evening and the perfect way to say goodbye. On Sunday I spent my last day with Sam which included a skating outing to Victoria Park and breakfast at Billy’s – some of my favourite London activities. I’m going to miss that boy and our cozy home while I’m away. Now I am just waiting, expectantly and excitedly. My backpack is leaning against the couch and I am eager to step off the plane in Seoul, South Korea and be greeted by my long lost pal.